Today we had quite the adventure attempting to go to the beach with the family. We ate at Outback last night and decided on an attempted arrival time at Ko Olina of 8:30 am. Running late, we got there at 8:45 only to find out that all the beaches were full and were turned around at the guard shack. The other half of our party had managed to get in only to find car lines at the parking lots of at least 10 cars. Last time we had 4 cars ahead of us and waited over 45 minutes for a spot and that was at 10:30 when it was actually possible people might leave the beach. We headed out onto the freeway looking for a possible alternate beach but eventually decided that we did not want to end up on the 6 o’clock news as “Local Japanese family of noobs killed on deserted beach in Nanakuli”. Eventually we got an “in” at Ko Olina and headed back for some free parking goodness. This picnic was a great excuse to finally use my big 3-tiered bento box! My contribution to our way too huge spread of food was corn, Aidell’s chicken meatballs, watermelon, and some old pupu type food that my mom used to make years and years ago. 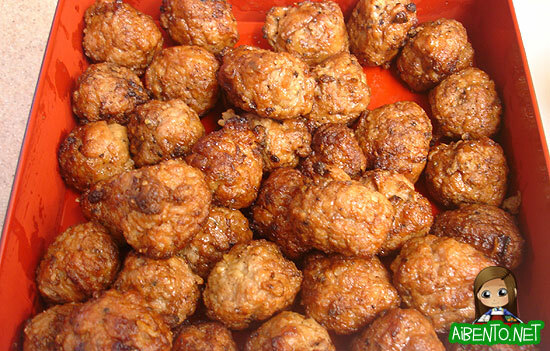 I’d read about the meatballs on Lunch in a Box and had seen them at Costco before. When I went to buy them yesterday it just so happened that they were giving out samples of them and though I didn’t get to try them, I’d gone specifically to get some. Due to the sampling almost every box was gone and I got the second to the last one. Go me! They were super easy to prepare. All I did was dump them into a bowl and microwave on high for 5 minutes! 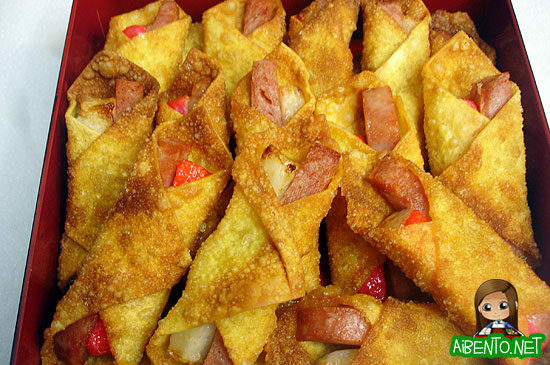 These lovely things are probably on the Top Five Foods You Should Never Eat list for Weight Watchers: deep fried won ton with spam and kamaboko! Oh so good though. Unfortunately I was unable to keep them crispy until lunchtime. I’d eaten one in the morning and wow they were full of win. Despite the sogginess, everyone loved them! Overall it was an okay beach trip, even with two kids afraid of the water and one afraid of sand. It rained. A lot. I pigged out on spam musubi, fried chicken, a huge onigiri, meatballs, won ton, corn, and watermelon. I’ll have to be really good all week and exercise cause man did I eat like 30 points today. I lost .5 lb last week! A good slow-down rate that I am perfectly fine with!